Writing an authentic novel that takes place in World War II Europe requires more than just research. It also requires a system for keeping track of the facts and finding the right ones when they’re needed. Helpful websites are easily found again by either bookmarking them or saving them to your browser’s favorite’s folder. Creating a simple bibliography will track books, videos, and personal interviews. But what about the pages and pages of notes you take while conducting online research, reading books, watching documentaries, and talking to sources? How do you keep them organized? I tried index cards, but then I needed to figure out some kind of filing system. Besides, an index box is awkward to carry from home to the library to the coffee shop. Instead I use blank books. Not the fancy journal kind of blank book, but the office supply store blank book with spiral bounding so that the pages, which are about the size of a typical book, lay flat no matter which side I’m writing on. And I write on both sides. I start out with two such books. The first one is devoted to my novel. The blank book for my debut novel, Where Treasure Hides, begins with a journal-type entry written by Alison Schuyler, my female protagonist. A couple of pages have dates and years scribbled upon them as I figured out my characters’ birthdates and ages. Further on, each character gets a page where I write down physical characteristics, personality quirks, and any other significant information. For example, my page on Count Theodor Scheidemann notes that he has a dimpled smile and a pale dueling scar across his lower cheek and jawline. He’s restoring an old family chalet in Bavaria, and his father died during the winter of 1938-39. On other pages, I explored options for the characters and the storyline by freewriting about possibilities, motivations, and turning points. I’m not sure I’d have ever been able to understand Alison’s heart (or the family discord) without these freewriting entries. The second book is a haphazard collection of research notes. To write Treasure, I read books and watched documentaries on a variety of topics including Holland, Vermeer, the Monuments Men, the looting of art, Colditz Castle (a notorious POW camp), and survivors who hid during the war. As I read, I copied interesting and pertinent information into my blank book. I may have three or four pages of notes from Book A; the next page may be notes from a Military Channel documentary; then the next couple of pages may be notes from Book B followed by more notes from Book A.
Haphazard, yes. But somehow the mish-mash nourishes my creativity. When it came time to plot Treasure, I read through my blank books (yes, there was more than one by this time) and wrote important info on square sticky notes. I arranged and rearranged the sticky notes on a large sheet of drawing paper to organize specific scenes and historic events. As multi-stepped as it may sound, this process works great for me. What are your favorite research and organizing tips? Author Johnnie Alexander Donley writes stories of suspense, intrigue, and romance set in World War II. 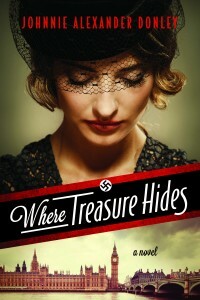 Her debut book, Where Treasure Hides, won the American Christian Fiction Writers Genesis contest for Historical Fiction in 2011. A history enthusiast, Johnnie has also edited nonfiction manuscripts and textbooks. 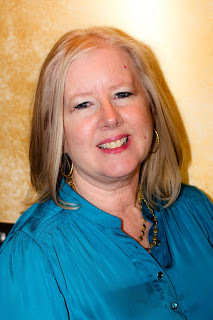 She is a founding member of the Central Florida chapter of American Christian Fiction Writers. A longtime Florida resident, Johnnie treasures family memories, classic movies, shelves full of books, and her papillon Rugby. I use highlighters in different colors to show what categories my notes belong in. I don’t highlight the whole things, just make dots at the beginnings of sections. Some things get dots in more than one color. Janet, that’s a neat idea. I especially like the thought of using the dots so that you can use more than one color. What kind of categories do you have?